With the governor and majorities in both houses of the legislature favoring legalization, de Blasio details all that he wants it to accomplish. New York Mayor Bill de Blasio just came out in support of recreational cannabis legalization in New York following the results of an in-depth report. In “A Fair Approach to Marijuana,” the 79-page report compiled by the Mayor’s Task Force on Cannabis Legalization, de Blasio echoes Governor Andrew Cuomo’s pledge to legalize recreational cannabis and outlines exactly how exactly New York City should approach it. Legal cannabis is coming to New York — but there are still a lot of questions left unanswered. Here’s what New Yorkers should expect from cannabis legalization, according to NYC Mayor Bill de Blasio’s report and recent statements. Big cannabis can mean different things. For one, we’re already seeing the creation of big cannabis corporations (especially in Canada) that have the potential to dominate the market, as is the norm in the alcohol, pharmaceutical and tobacco industries. Big cannabis can also mean the increased involvement of large, non-cannabis corporations in the industry. Though the cannabis industry is still young, big businesses ranging from Morson Coors to Microsoft, are already investing in it. More specifically, only 12 businesses received 20 percent of California’s cannabis cultivation licenses according to a Marijuana Business Daily report. Though large-scale cultivation will not be legal in California until 2023, California’s legislation made it possible for businesses to create large grow operations in separate locations. This has culminated in a lawsuit against the California Department of Food and Agriculture (CDFA). In his letter of introduction to “A Fair Approach to Marijuana,” de Blasio writes, “Legalization can follow two routes. In one, corporate Cannabis rushes in and seizes a big, new market, driven by a single motive: greed. 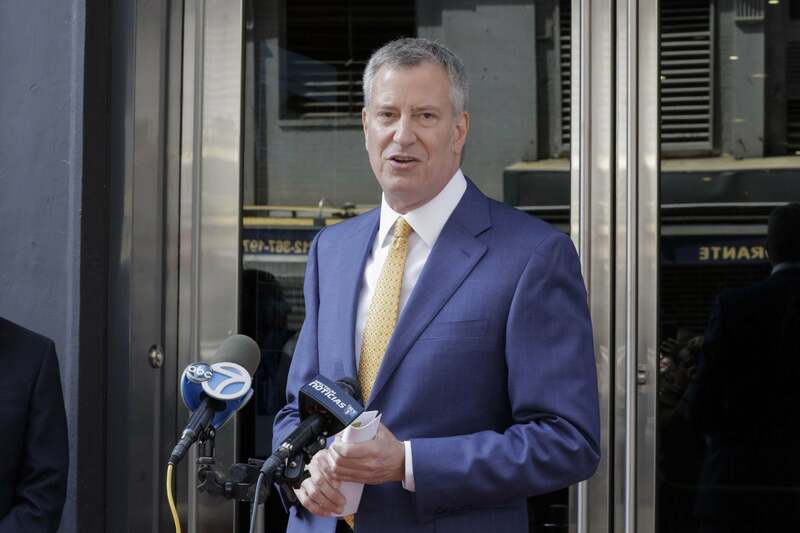 In another, New Yorkers build their own local cannabis industry.” With these opening statements, de Blasio signals that one of his chief concerns regarding cannabis legislation is fostering small businesses. Specifically, the Mayor cites empowering local government as the solution to preventing corporate dominance. This would mean creating a dual state-local licensing system and preventing companies from having complete control over the entire supply chain. New York City has received a lot of attention regarding racial disparities in cannabis-related arrests, so much so that it’s one of the main reasons for New York cannabis legalization. In early 2018, a report came out showing that 87 percent of people arrested for cannabis possession were black or Hispanic, despite the fact that different ethnicities consumed approximately the same amount of weed. The realities of racially-biased policing in New York City and the lifelong consequences of having a criminal record, are front and center in NYC Mayor Bill de Blasio’s report. “I have been convinced that we can establish a regulatory framework that keeps our streets safe, rights the wrongs of the past, and gives economic opportunity to communities hit hardest by the war on drugs,” the Mayor said in a public statement. The Mayoral report recommends restorative justice, meaning the automatic expungement of all criminal records for offenses that would be legal under new legislation. Additionally, the Mayor advocates for bringing cannabis job opportunities to neighborhoods with the most cannabis-related arrests. This means providing job training, loan programs and tax revenue. And, with the legalization of adult-use cannabis, cannabis law violations would become a civil, rather than criminal, offenses. De Blasio wasn’t the only New York City politician to address the legacy of the War on Drugs. In response to the report, Comptroller Scott Stringer advocated for a cannabis equity program and reinvesting cannabis tax revenue into the communities that have suffered the most during the War on Drugs. “We know that lower-income Black and Latinx New Yorkers have been hit hardest by marijuana enforcement, and they should be the first to benefit from legalization,” Stringer explained. In this way, New York City could mirror how some West Coast cities have dealt with past cannabis arrests. Los Angeles, Sacramento, San Francisco and Oakland have similar programs, and more are planned following the passage of the California Cannabis Equity Act of 2018. However, marijuana social equity programs have reportedly had difficulty staffing and many need better access to funding and more regulatory oversight ensuring that participants receive a fair deal from investors. In other words, addressing the legacy of the War on Drugs is complex and should be a big part of legislation from the start. In “A Fair Approach to Marijuana,” de Blasio cites Big Tobacco, Big Oil and Big Pharma as examples of what not to do when legalizing cannabis. This means that instead of concealing health information, the Mayor wants to promote education, especially to prevent underage cannabis consumption, and ensure the safety of the supply chain. First Lady Chirlane McCray, who runs mental health-focused non-profit ThriveNYC and advises Mayor de Blasio, explained, “We must do everything we can to protect our city’s young people, and educate all New Yorkers about marijuana use.” Though federal data shows that teenage cannabis use decreased in Colorado following legalization, there is still concern among politicians that legalization means more underage use. For governments and businesses alike, supply chain management remains one of the cannabis industry’s biggest hurdles. For cannabis businesses, staying within the law means licensing, lab testing and tracking goods from seed to sale. On top of state-specific regulations, businesses often have to comply with county laws that can vary widely. And not only is lab testing a slow and expensive process, but record keeping — and proving that your record keeping is accurate — is difficult. Cannabis laws must guarantee product safety but safety standards cannot be so high that smaller businesses cannot reach them. For this reason and more, cannabis cryptocurrency can be a form of supply chain management. The crucial role of local government. Local involvement doesn’t only mean bringing legal cannabis opportunities to communities targeted by the War on Drugs; It also allows communities to decide whether they want to legalize cannabis at all. De Blasio’s report concludes that an important part of local involvement is letting communities decide where, and if, they permit cannabis businesses to set up shop. How many cannabis businesses can open in a specific neighborhood? How close can cannabis businesses be to schools and to one another? De Blasio suggests that local governments should be given the authority to outlaw cannabis businesses, as is the case in Massachusetts and California. Health and safety are of the utmost importance. This means supply chain management, education, and curbing underage consumption. For cannabis businesses, a focus on enforcing safety laws could translate to a lot of regulatory oversight, meaning stringent lab testing requirements as we’ve seen in California. Local governments will have a big impact. De Blasio favors giving communities control over business licensing. This could mean several things: For one, smaller, local businesses could receive priority over larger corporations. However, some communities may opt out of licensing any cannabis businesses all together. And for those businesses that are licensed, this could mean dealing with both state and local laws, which can be challenging. Arrest records will most likely be expunged. One of New York City’s biggest cited reasons for legalizing cannabis is curbing racially-biased arrests, many of which are cannabis possession charges. Not only would legalization demote cannabis-related infractions to civil, rather than criminal, charges, but there is strong political momentum to expunge all convictions for crimes that would, under new legislation, be legal. Mayor de Blasio’s recommendations could have a big impact on statewide cannabis legalization. However, they also highlight the number of regulatory decisions that New York lawmakers have to debate before legalization becomes a reality.